This entry was posted in News and tagged Charter, Health Insurance, InFlightER, Medical Rescue, VH-IER on October 17, 2014 by William Gebers. This entry was posted in News and tagged bluesky, InFlightER, Medical Rescue on October 17, 2014 by William Gebers. InflightER and Australian Air Medical are proud to announce the release of a new level of air medical retrieval service to the Australasian and Asia Pacific marketplace. With a strong focus on quality, capability and value for money, our fully integrated class-leading product extracts the best experience and hardware from the worlds of critical care medicine and aviation with a simultaneous emphasis on cost containment, creating a new industry benchmark. Based out of New South Wales and Queensland, our Westwind II VH-IER is an incredibly economical and capable jet platform to operate and maintain and, with a range of up to 2700nm, a speed of up to 470 knots and up to 400% greater oxygen carrying capacity than many of our competitors, wherever you are in Australasia or the Asia Pacific region you are unlikely to be out of our reach. This new service has the most sophisticated jet air medical governance and quality framework in the southern hemisphere, and the clinical skill set of our doctors, critical care paramedics and flight nurses is enhanced by an advanced suite of critical care equipment, centred upon state-of-the-art dual Zoll X and ResMed Elisee life support systems, enabling the simultaneous transport of two critical care patients and up to four medical staff. Medical care after landing is supported by an independent aircraft medical electrical supply requiring no engine power, further reducing costs. Our pilots are some of the most experienced in the industry and are assisted by the latest aircraft terrain and collision avoidance systems and navigation technology, ensuring safe flight wherever we travel. Leading edge in-flight communications, swift broadband, patient monitoring hardware and real-time electronic patient care record software enables continuous verbal contact and clinical data streaming from our medical teams in the air, anywhere in the world, to our central operations base on the ground – they keep us up to date and we keep you up to date. 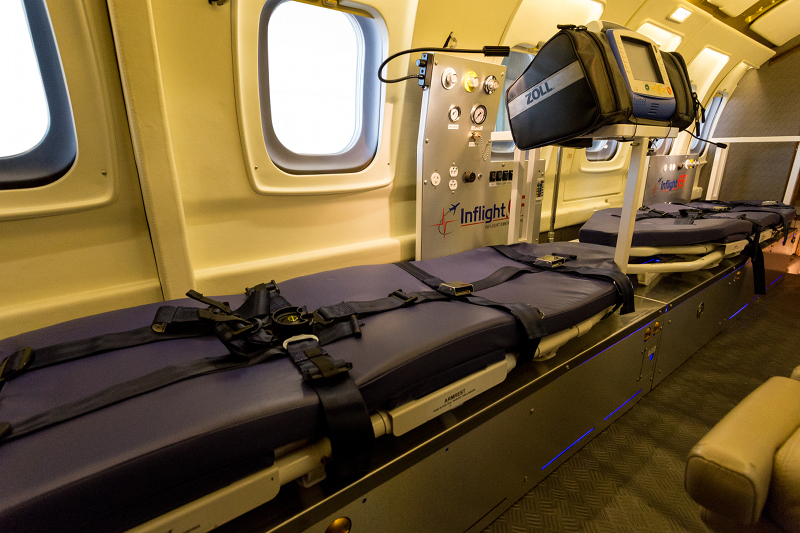 The exceptional strength of the Westwind II airframe has allowed us to create a custom made and industry leading dual bariatric stretcher capability, featuring ‘no-lift’ loading technology, with both the stretcher and base safely supporting a patient weight of up to 230kg. This ability is unique in our region. The stretcher system can also accommodate dual neonatal humidicribs. With an aviation team led by Neil Allen, a 33 year industry veteran, and a medical team led by Professor Sean Keogh, an acknowledged world class leader in air medical governance, safety and operations, there is no quality driven and cost effective service that compares; InflightER and Australian Air Medical are now ready to serve those in need. Our coordination centre can be reached for advice and quotes, 24 hours a day, every day, on +61 2 4257 7437. This entry was posted in News and tagged InFlightER, VH-IER on October 17, 2014 by William Gebers.